Who likes to attend a total snooze-fest wedding and get tortured with interminable boredom? 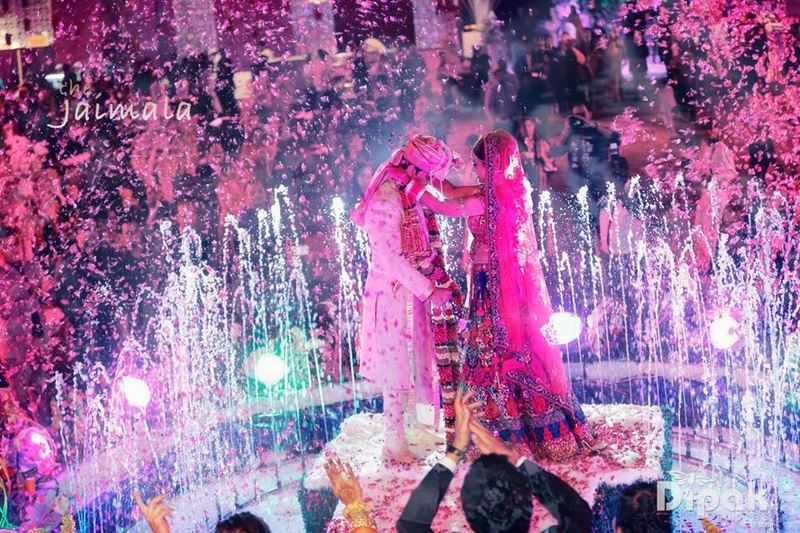 In India, weddings are not just about functions, rituals or ceremonies; they are way more than that. Whether you are hosting a destination wedding ceremony or a simple affair in your city, adding an X-factor to the special day only makes it memorable. Since Indian weddings go on for more than a day, it wouldn’t hurt to include interesting entertaining elements that will keep the wedding guests involved. Knock it out of the park by incorporating these unique wedding entertainment ideas on your wedding day. As musical as it sounds, it adds a spiritual feel to the entire wedding environment. Jal Tarang players use a set of ceramic bowls tuned with water and different colours. The amount of water and colour is directly associated with specific set of tunes that it produces. The resonance created by striking the edge of the bowl with a stick creates the magical sounds. Now how cool is that! It leaves you mesmerised with the rhythm and compels you to listen to it over and over again. When the world has gone digital, why leave weddings? Instead of the regular photobooth with silly props, install a digital simulator box. Inside it, your wedding guests can take a ride on a roller-coaster, fly through the city’s skyline in an airplane or run for their lives from ginormous dinosaurs and zombies. Kids or adults, everyone just loves to squish inside this box and have a great time. From scary faces to the jaw-dropping moments, capture every hilarious expression through a selfie stick. Common now, who doesn’t love this! All of us would appreciate a small trip to the future. Having a psychic hover their hand over a crystal ball, a palm reader or a tarot-card reader at weddings is always an interesting sight to watch. As a lot of wedding guests would love to spend their time over these fun counters, it’s also one of the best wedding entertainment options today. Besides having our selfies clicked, all of us wouldn’t mind a comic depiction of ourselves, would we? So, how about getting a talented wedding caricaturist who will make fun and interesting portraits of everyone? Wedding guests would love a small memento and a comic portrait would certainly bring a smile on their face. It’s traditional and beautiful. You can use these string-controlled characters to tell your life’s story or describe your entire journey. It’s amazingly affordable and too much fun to witness the groom riding a horse and rescuing the bride of her dreams (if that’s your story). No one at your wedding would get tired of witnessing an entertaining puppet show. No, it’s not a new kind of helipad. DDR is an abbreviation for Dance Dance Revolution and boy, it creates one! This incredible wedding entertainment idea gives a crazy adrenaline rush and will make your foot tap like there’s no tomorrow. It uses a step-zone and screen, where you dance to the beats and correspond your movements with the instructions given on the step-zone. You can even battle with your opponent and beat their score to be the ultimate winner. God bless the Japanese who invented this mean machine! There’s nothing like having a rib-tickling moment during the wedding day. In fact, a talented stand-up comedian or an actor’s impersonator will definitely leave you in splits. This is the best way to get every wedding guest’s attention and keep them on the very edge of their seats. Amaze everyone with a fascinating wedding aerial act! From the bride arriving on a flying peacock to the groom’s entry to the mandap as a superman, there are plenty of options to keep your wedding guests hooked through a superb aerial display. You can also have a group of acrobats or gymnasts perform a jaw-dropping aerial act. If you aren’t happy with this and want something spectacular, seal the deal with a breathtaking wedding firework display. It’s so ‘in’! And probably the best in the list. A Flashmob moment can be one of the most memorable moments from the wedding day. All you have to do is choose a favourite song, add a few steps and shimmies together and voila—you have a flashmob ready! It is also one of the best ways to get everyone involved in your wedding celebrations. Break the monotony by including these fabulous and unique entertainment ideas for the wedding day. Hire professional wedding vendors who bring along all the right equipment for an unforgettable experience. So, which one do you think is the most interesting wedding entertainment option? If you’ve tried anything offbeat at a recent wedding, do let us know at content@weddingz.in!